Big social histories can seem forbidding with their blocks of print, lots of footnotes, and, too often, turgid writing style. In the hands of Jenny Uglow, though, history is anything but pedantic. I have been a fan of Uglow’s history writing since I read The Lunar Men, a collective biography of five men who, as Uglow posits, were “the inventors of the modern world, 1730-1810.” Here, Uglow brings her fluid writing style and attention to detail to the lives of the inhabitants of the Great Britain at the end of the 18th and beginning of the 19th centuries. In many ways, these times do not seem so far removed from our own, as social unrest, sectarian violence, fear of war and invasion, and income inequality set the tone. Napoleon’s military successes on the European continent led to his increasing power in France and heightened fears that his next target would be the English coast. Uprisings in Ireland only exacerbated these fears. Food shortages across England left many starving and taxation to pay for the war proved unpopular, leading to civil unrest that in light of the recent deposition and execution of Louis XVI left King George concerned not only for his crown but for his neck. In telling these stories, Uglow moves easily and with mastery from the general to the specific. She makes exceptional use of diaries, letters, and journal entries to indicate how individuals responded to circumstances and then puts those reactions into the broader picture. With the 200th anniversary of the Battle of Waterloo coming in June, anyone interested in the Napoleonic period will find something to enjoy here. Check the WRL catalog for In These Times. I am always on the lookout for academic fiction. I love novels set in English departments and featuring an amusing cast of characters—David Lodge, Michael Malone, James Hynes, Richard Russo, and Jon Hassler are among my favorites. Now I can add Julie Schumacher to the list. Told as a series of one-sided letters of recommendation, this novel is both funny and poignant. The protagonist, and writer of recommendations, is Jason Fitger, a tenured English professor at Payne, a not so highly rated Midwest university. The letters here are for students, some of whom he has never taught but who are desperate for a recommendation for a job or a fellowship, and for fellow faculty members and college staff. Fitger’s voice is the only one we hear, and he is in turn cranky, sarcastic, and petulant, but he is also concerned about his students’ well-being and clearly cares deeply for his friends and colleagues, even those with whom he has fallen out over the years. At first the book seems mostly a satire, but as you get into the story, the letters reveal the story of Fitger’s life, his struggles as a writer, and his contention with the human condition. He becomes a character for whom the reader cares, and the end of the novel is both somber and redemptive. Check the WRL catalog for Dear Committee Members. Charlotte’s post about Lloyd Alexander got me thinking about books for younger readers that are also of interest to adults. 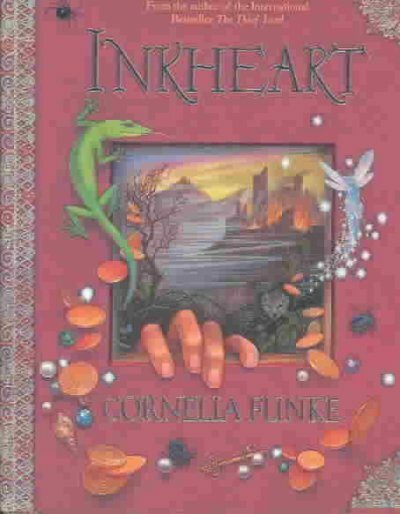 I think that Cornelia Funke’s Inkheart and its sequels, Inkspell and Inkdeath fill the bill here. Although they are marketed as young adult fiction, they will work equally well for anyone who is a fantasy fan. These are very literary stories, premised on the ability of the some characters to read people in and out of fictional tales while reading aloud. It sounds like a great idea at first, but the problem is that when something is read out of a story, something present in the real world is read into the story. Meggie, our heroine, is the daughter of a bookbinder named Mo, and she wonders why he will not read her stories from books. We discover that Meggie lost her mother when Mo accidentally reads her into a dark tale. Worse, Mo has read out of the story its arch villain, Capricorn, who is bent on getting back into his story and uses Meggie as a tool to coerce Mo into once again reading aloud. As Meggie and Mo are pursued, captured, and attempt to escape, they meet with unexpected help, are betrayed by some that they thought true, and must rely on the power of language to face Capricorn and his men. Funke tells a delightful though dark tale about the power of words and the love of books and reading. It is a great story for anyone who shares that love. 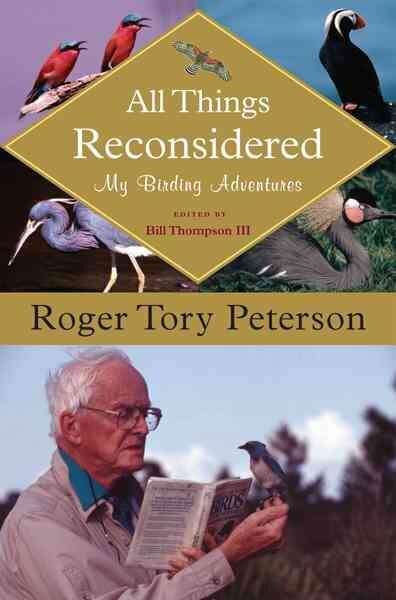 At first, it sounds like some sort of NPR show or something, but All Things Reconsidered is actually a delightful collection of essays that Roger Tory Peterson published in Bird Watcher’s Digest over the last decade and a bit of his life. Peterson’s name is a household word among birders, and his Field Guide to the Birds can be found all over the country, often in tattered, field-worn condition (my personal copy is taped together and dates from ornithology class at William and Mary ca. 1982). In addition to being an excellent illustrator, Peterson is an engaging writer, with an obvious affection for and appreciation of the natural world. Whether writing about confusing fall warblers, birding in Kenya, or the renaissance of the Peregrine Falcon, Peterson’s clear prose style and narrative line are a delight to the ear, and the photographs and drawings are a delight for the eye. These are personal stories, introducing the reader to many of the characters of the bird world, both avian and human. They also are a fascinating look at the environmental and citizen science movements over the years, as seen through Peterson’s life and work. Another great collection of stories to prepare you for observing spring migration. It is Spring once again (or almost anyway) and soon the Williamsburg area will begin to see migrant birds coming through on their way North. After a long, cold Winter, it is a joy to get outside and be alert to what birds might appear today. 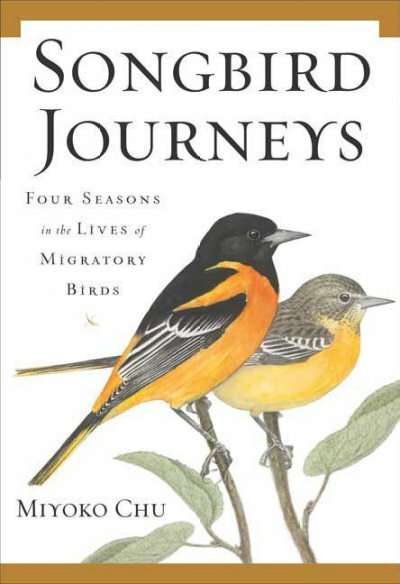 It is almost as good to be inside reading Miyoko Chu’s fascinating book about bird migration. Chu, who works at the acclaimed Cornell Laboratory of Ornithology, has written a book anyone who loves birds should read. It is a deft blend of science and history, along with practical information about watching migrant birds at the different seasons of the year. Chu covers topics from birdsong to nesting to banding in her discussion of migrating birds. Her narrative style moves easily from the specific (looking at a particular species’ migratory habits) to the general (examining how habitat loss at either end of the migration affects bird populations). Her writing is crisp and elegant, and always accessible for the lay reader. Anyone who enjoys birding will find something to like here. It is a great book for those rainy days where the birds are not calling or moving much. 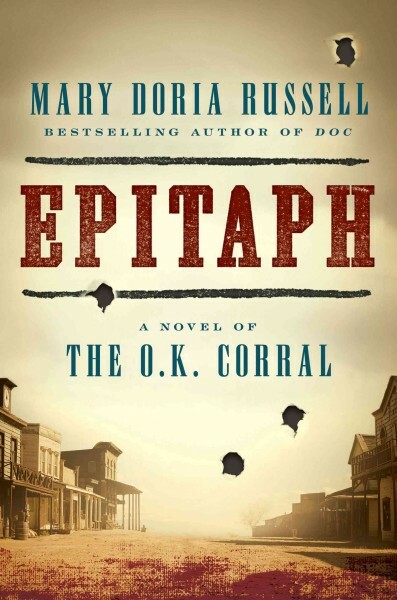 Back in 2012, I wrote about Mary Doria Russell’s superb historical novel Doc, where she relates the backstory of the gunfight at OK Corral, looking at the early lives of Doc Holliday and the Earps. I am happy to report that she does an equally excellent job in her newest novel Epitaph, bringing the story forward through the incident in Tombstone and beyond. As in the earlier story, Russell focuses on characters and there are lots of them in this story. While not quite as complicated as a Russian novel, the cast here is large and you have to pay attention. This is in part because of the fluid nature of the relationships between the characters–friends, or at least drinking buddies, one day and then deadly enemies the next. In many ways this is a sadder and darker story than Doc. Where the first story was haunted by premonitions of death, death is constantly present in Epitaph. There is also the pain of seeing relationships that seemed so strong in Doc, especially between Wyatt and Holliday, be tried, and sometimes found wanting. Nonetheless, anyone interested in the Western history, or in the study of human nature, will find much to enjoy in this somber sequel.